Flemish education authorities set minimum attainment targets for school students and impose regular inspections to ensure that schools comply. 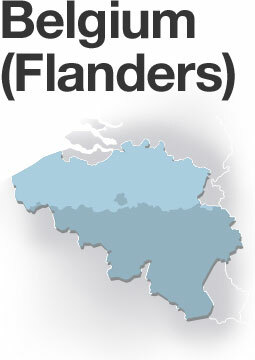 With a population of 6.3 million, Flanders accounts for 57% of Belgium's total population and covers 44% of the nation's territory. Rapid modernization over two generations has been accompanied by strong emphasis on the socio-economic value of education and a rapid rise in educational participation. Flanders has more very high performers and fewer very low performers than most other education systems. But it also has higher disparities between pupils from well-off families and those from disadvantaged backgrounds. Pre-primary education from age 2-1/2 is almost universal. Compulsory education starts at age six and runs through until age 18, with the possibility of part-time education from age 16. Around 40% go on to general secondary education (ASO: Algemeen secundair onderwijs), in preparation for university studies. Around 30% enter technical secondary education (TSO: Technisch secundair onderwijs) in preparation for a technical profession or tertiary education. A slightly smaller proportion go into vocational secondary education (BSO: Beroepssecundair onderwijs) in preparation for a specific occupation. A few opt for secondary arts education (KSO: Kunst secundair onderwijs) in preparation for an artistic profession or tertiary education. In 1999, the Flemish government launched a program of voluntary collaborative partnerships between secondary schools to share experiences and resources. Schools that joined such "communities of schools" were granted extra resources, such as funding for extra teaching time. In 2003, the system was extended to primary schools, and it now covers almost all Flemish schools. In 2002, the Flemish government launched local consultation platforms to promote equal educational opportunities. Schools with large numbers of pupils from disadvantaged backgrounds were granted extra funding and required to elaborate an equal opportunity plan and carry out monitoring and self-evaluation. In 2004, a Decree on Transparency in Governance allowed for the publication of school inspection reports. In 2009, a Decree on Quality of Education stipulated that each school is responsible for providing good quality education, placing individual schools' efforts at the center of the evaluation process. In 2009, Flanders spent the equivalent of 6.4% of its gross domestic product on education institutions, compared to an average for OECD countries of 6.2%. In 2012, a total of 1,120,371 pupils were enrolled in 3,422 full-time nursery, primary and secondary establishments. Of these, 440,520 were enrolled in 1,068 full-time secondary schools, 69% of which were government-funded but privately run. The Flemish government devoted 10.4 billion euros, or 38.5% of its total budget, to education in 2012. Of this, 4.1 billion euros, or 39.5% of the education budget, was spent on secondary education, and 3.45 billion euros, or 33.3%, on nursery and primary schools. In the 2009 PISA tests, Flemish students scored an average 519 points in reading, 537 points in mathematics and 526 points in science, ranking Flanders among the top systems worldwide. Socio-economic differences strongly affect performance, however. In the 2009 PISA tests, the most advantaged 25% of Flemish students out-scored the least advantaged 25% by 100 score points, indicating a significant educational gap. The proportion of low performing students with an immigrant background was nearly three times the proportion of low performing native students. A system of annual attainment targets results in a high proportion of pupils being obliged to repeat classes. In the 2009 PISA survey, 13.4% of 15-year-olds reported that they had repeated at least one class in primary school, while 6.9% said that they had repeated the first grade of secondary school and 4.8% the second grade. Disadvantaged children, or those with lower socio-economic status, are over-represented in vocational and technical schools at secondary level, and there is a perception of lower quality attached to these schools. Under Belgium's federal system of government, responsibility for education policy lies with its three linguistic communities, the Dutch-speaking Flemish community, the French-speaking community and the German-speaking community. The regional government of Flanders, combining both regional and community powers, oversees an education system that is among the world's top performers. One of the key features of the Flemish system is the extensive degree of autonomy granted to individual schools. Freedom of choice in education is a constitutional right in Belgium. Anyone can set up a school and parents and students can choose any school they want. Subject to meeting minimum quality standards and complying with legal obligations, schools in Flanders are free to follow whatever pedagogical project they wish, receiving public funding based on the numbers of pupils enrolled and on the socio-economic background of students (students from disadvantaged social groups get more funding).The result is a highly competitive environment, in which schools vie with each other for pupils and parents shop around to find the best school for their child. Around 70% of Flemish pupils attend government-funded but privately run schools founded by individuals or associations linked mainly to the Catholic Church but also to other religious denominations or using particular educational approaches, such as the Freinet, Montessori or Steiner methods. (Such privately run schools account for around 62% of all pupils at nursery and primary level, rising to around 75% at secondary level.) Other pupils attend community schools organized under the auspices of the Council for Flemish Community Education or publicly run schools organized by municipal or provincial authorities. As the performance of Flemish students in international tests such as PISA shows, the system has many strong points. It gives innovative schools the freedom to develop individual profiles and a culture of excellence. It allows more traditional schools to pursue tried and tested pedagogical methods with positive results. But the system also has drawbacks. Patterns of school choice are largely determined by social background, which leads to high levels of segregation. In prestigious and high-achieving schools, demand for places often exceeds capacity. Parents and pupils have no guarantee that freedom of education will give them access to the school of their choice. There are no standard public examinations to test children at the end of their schooling, and the system leaves open the possibility for schools to under-perform. The government sets minimum attainment targets which specify the knowledge, skills and attitudes that students should demonstrate by the end of primary education and the first, second and third stages of secondary education. But these do not provide sufficient stimulus for schools to strive for excellence and continuous improvement, and there is no specific guidance on different performance levels to be achieved beyond the minimum. In the 2009 PISA tests, children from disadvantaged backgrounds performed significantly less well than their better-off peers. To raise standards, the Flemish government has developed a strategy based on a so-called "triangle of quality". The first corner of this triangle is the schools themselves. By law, schools are responsible for the quality of the education that they deliver. All are required to submit their pedagogical projects to the Ministry for Education and Training for vetting. and all schools are called upon to meet generalized attainment targets, at the end of primary schooling for primary schools and at the end of each stage in secondary education. Each school is advised on school policies by its School Council, comprising members of the school and the local community. By law, schools are required to promote participation of key stakeholders and secondary schools must have student councils through which students can express their views. The second corner of the triangle consists of pedagogical advisory services linked to the different networks of Catholic or other privately run schools, Community schools and municipal or provincial schools. Their role is to offer educational and methodological support and to advise schools on how to raise their performance to meet the minimum requirements. The third corner is the Flemish School Inspectorate, whose inspectors check the quality of outcomes at individual schools through classroom observation and interviews with school management, teachers and students. Schools where quality concerns are identified are given a deadline for improvement, on penalty of forfeiting government subsidies if they fail to meet it. Since 2007, the Inspectorate's reports have been publicly available on its website.